The CVO Street Glide® is decked out fender to fender with custom details and our most powerful engine and sound system. The all-new black granite Twin-Cooled™ Milwaukee Eight™ 114 engine is at the heart and when you unleash it at the light, hold on. Its Twin-Cooled system delivers unparalleled OE power that you will feel in the seat of your pants. You get superior comfort and performance from an all-new dual bending valve front suspension and an all-new, easily adjustable rear suspension with emulsion rear shocks that give you 23 turns of pre-load adjustment. The 6.5” BOOM!™ Stage II speakers are powered by a 300-watt amplifier, so even the stereo on this machine has plenty of muscle. You also our exclusive CVO™ premium integrated security system with a power locking fob. Welcome to the hot rod custom touring machine taken to the ultimate level of performance and style. FAIRING MOUNTED INSTRUMENTS: There's a whole lot of country out there to look at, so we designed the gauges to give you the more mundane details of the trip with a quick and easy glance. Here's a rundown of what you get in the 2-inch spun-aluminum-faced gauges: electronic speedometer with odometer, dual resettable trip meter, fuel range countdown, engine diagnostic readout; plus LED Indicator lights for low fuel, battery, engine diagnostics, 6-speed, cruise control, ABS, security system, turn signals, neutral, high beam and low oil pressure. VENTILATOR ELITE AIR CLEANER: Centered in the classic lines of the Twin-Cooled™ Milwaukee-Eight™ 114 engine your eyes can't miss the Ventilator Elite Air Cleaner Cover with Screamin Eagle® 114 insert. It leaves no doubt that this engine means business. TIRE PRESSURE MONITORING SYSTEM: The big 6.5-inch full-color touch screen on the CVO™ Street Glide® motorcycle is loaded with handy info to keep you rolling, including a Harley-Davidson first: tire-pressure monitoring right in the display. No need to pull over and dig out the tire gauge to make sure you’ve got your psi up to snuff. A glance down at the big display and you know you’re good to go. There’s also an alert light on the odometer, just to make sure you’re covered. CHROME DUAL EXHAUST: The premium custom look goes the distance on the CVO™ Street Glide® model with the chrome dual exhaust. Now with a relocated rear exhaust port that moves heat away from the passenger, it features 4-inch touring mufflers, chrome end caps and chrome exhaust shields. Relish in the rumble and performance of these high-end pipes. ALL-NEW TWIN-COOLED™ MILWAUKEE-EIGHT™ 114 ENGINE: If you started in 1909 with the very first Harley-Davidson® V-Twin engine and worked your way up through every engine, every innovation, every improvement, every ride, every durability test in all those years and countless miles since, you arrive at the Twin Cooled™ Milwaukee-Eight™ 114 engine. This is the top of the line. 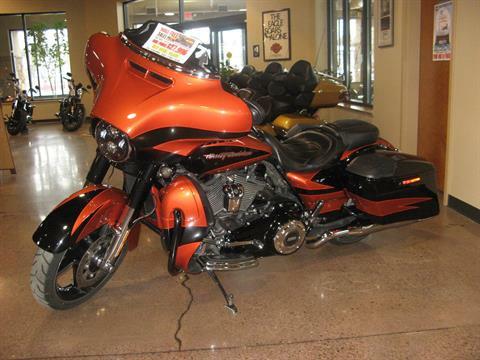 114 cubic inches of air and precision cooled Harley-Davidson® V-Twin engine power. Twin cooling cools the heads around the exhaust ports to deliver at or near peak performance under all operating conditions and temperatures. Today, it’s a whole new ride. COLOR-MATCHED SPLITSTREAM VENT TRIM: The CVO™ Street Glide® Motorcycle is loaded with long-haul function, but what really makes a machine like this rule the highway is all the form built into every last functional detail. Take the splitstream vent in the fairing. It’s a key innovation in rider comfort, but we took it a step further and color-matched it to the fairing’s dazzling paint to make sure the front end of the bike looks tight and clean. The only thing as fun as getting lost in the countryside is getting lost just staring into the details of your ride. WIDE SET HANDLEBAR: Classic style and maximum comfort. That's the perfect balance of the wide set handlebars that come standard on the CVO™ Street Glide® model. They're designed to keep you comfortably propped in a commanding position while making sure your neck muscles stay calm and relaxed mile after mile, state after state. Durable stainless steel ensures the structural rigidity you expect from a Harley-Davidson® motorcycle with the deep, lustrous finish you desire. TWO UP SEATING: Modern styling and comfort that doesn't sacrifice an ounce of nostalgic style: this ultimate Touring saddle features a sculpted seat with a deeper contoured bucket and narrower neck, to relieve pressure on your thighs, while providing more back support and comfort for a wide variety of rider sizes. And the lower seat height—26.1 inches to be exact—puts your feet closer to the road to enhance your confidence. Additionally, the leather trim and premium stitching accentuate the advanced ergonomics while giving the seat that sharp detail you only find on a Harley-Davidson® motorcycle. It's science in service of comfort, and your way to beat fatigue over the long haul. KEYLESS INGITION FOB WITH INTEGRATED SECURITY: Walk up to the CVO™ Street Glide® model, throw your leg over the saddle and go. This is about using the innovations that make the ride better. And keyless ignition is one of them. Even better, our all-in-one fob also includes automatic security and locking functions. 6.5 INCH FULL COLOR TOUCH SCREEN DISPLAY: This 6.5-inch full-color touch screen puts all your information in front of you bigger than ever. Modern graphics, colors you can dial in, and auto and manual dim. Designed to sit stylishly inside your fairing, it takes screen technology to an eye-popping level of Harley-Davidson functionality. This is more than you expect, but when you’re going all the way, it’s everything you deserve. 6.5 INCH BOOM!™ STAGE II 3-WAY FRONT SPEAKERS: Big, clear sound for your stereo is what you want and that’s what you get on the CVO™ Street Glide® motorcycle. It’s served up via 6.5” BOOM!™ Audio Stage II 3-way speakers in front. They make the sound coming at you as epic as the road ahead. CUSTOM-TUNED STATIC AND DYNAMIC EQUALIZER: You can count on premium sound quality to go with all the volume thanks to the custom-tuned static and dynamic Equalizer that comes standard on the CVO™ Street Glide® motorcycle. There’s nothing better than the right road, the right song and a sound system dialed in for the ride. DEDICATED 300 WATT FRONT AMPLIFIER: The 6.5” BOOM!™ Stage II speakers in the front are powered by a 300 watt amplifier, with a separate amp channel for the 6.5" woven carbon fiber cone woofer, and another one powering the polypropylene fiber dome midrange and aluminum dome tweeter. Even the stereo on this machine has plenty of muscle. VOICE RECOGNITION, BLUETOOTH™: The Boom!™ Box 6.5GT gives you voice recognition for hands-free operation of your mobile phone, navigation system and music. It’s also Bluetooth capable. Whatever you want, just say the word. Whether it’s directions to the next gas station, a call back to the office you’re not at today or a song that fits the stretch of road you’re on, it’ll be served up without missing a beat. HIGH-IMPACE PAINT AND GRAPHICS: Individually crafted and hand-finished paint and hand applied graphics come standard on all Harley-Davidson® Custom Vehicle Operations™ motorcycles, balancing style and premium appeal to create one-of-a-kind custom motorcycle masterpieces. The CVO™ Street Glide® model offers four exclusive color schemes: Starfire Black with Atomic Red, Sunburst Orange with Starfire Black, Candy Cobalt with Indigo Ink and Dark Slate Candy with Arctic Black. Skimping? The word's simply not in our vocabulary. GLOSS BLACK INNER FAIRING AND DESIGN: A premium gloss black finish comes standard on the inner fairing of the CVO™ Street Glide® motorcycle. It has raised black-faced stadium style gauges, a lighted tic band, and an electronic speedometer with a spun aluminum finish. All there because on a bike like this one, you can't help but go the extra mile. BULLET TURN SIGNALS AND LED LIGHTING: Bullet turn signals are a long-time favorite of the long-haul Harley-Davidson motorcycle rider, for their ability to give the bike a sleek, modern style. We took the CVO™ Street Glide® lighting even further by loading the housings with blazing LED lamps all the way around. You have what it takes to grab the attention of everyone around you. CHROM TANK CONSOLE WITH NEW CUSTOM INSERTS: Mounted on top of the classic Harley-Davidson® fuel tank, the CVO™ Street Glide® motorcycle features a chrome console with custom inserts. CLASSIC FUEL TANK: Part of the unmistakable style of the Harley-Davidson® CVO™ Street Glide® motorcycle is plenty of room for showing off your paint. 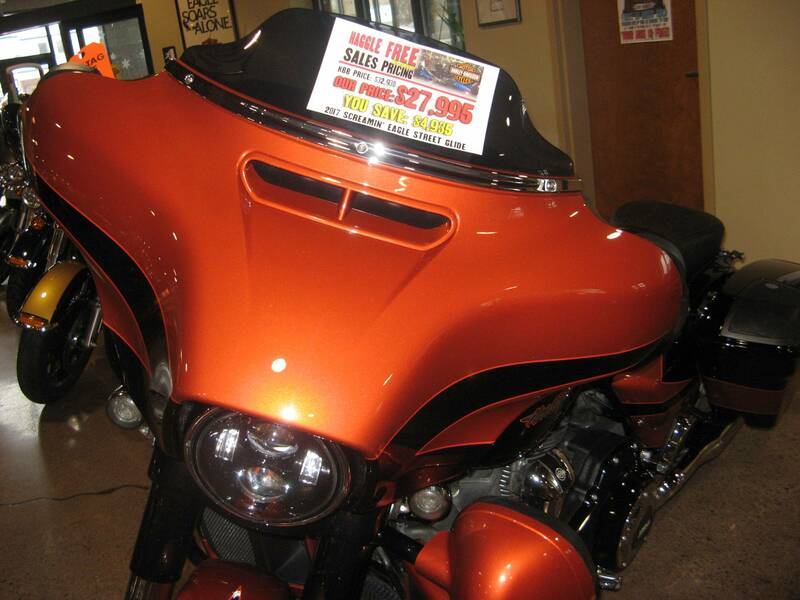 This classically styled, bold fuel tank doesn't just give you a bigger canvas for premium or custom paint; it holds 6 gallons of gas so you can eat up a lot more road between pit stops. We know fuel economy is important—but so is style. Sharp, eye-catching colors and precision-crafted Harley-Davidson® tank medallions complete the unique look of this tough bagger. CUSTOM LOW PROFILE, TWO-PIECE SEAT WITH INSERTS AND CUSTOM STITCHING: Check out the custom, low profile seat on the CVO™ Street Glide® motorcycle. Note the inserts and custom stitching on the seat. Craftsmanship like this is getting harder to find in the world today, but as long as we’re making CVO™ motorcycles, you’ll know where to look. EXTENDED SADDLEBAGS WITH INTEGRATED 5 X 7 IN. BOOM!™ AUDIO STAGE II 3-WAY SPEAKERS: The CVO™ Street Glide® model features injection molded extended saddlebags. They not only give you full-on hot rod bagger style, they give you booming sound for your stereo thanks to integrated 5” x 7” BOOM!™ Audio Stage II 3-way speakers. You also get carryout liners for getting your stuff from the parking lot to the motel, secure locks and easy one-hand operation. DERBY COVER & INSERT DESIGN: Design enhancements to the derby cover and insert doesn't just look good, they add a bit of function as well by providing more leg clearance for the rider. COLOR MATCHED COMPONENTS: It wouldn't be a Harley-Davidson® motorcycle if we didn't sweat the details. 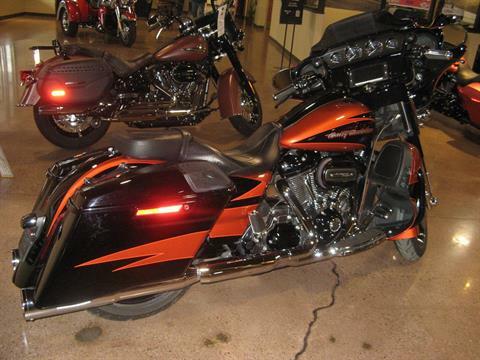 Note the color-matched fairing skirt on the CVO™ Street Glide® motorcycle this year. You also get a matching upper fork and slider cover. It's that little bit of extra attention in the design studio that gets a little bit of extra respect on the street. AIRFLOW COLLECTION: The CVO™ Street Glide® motorcycle rolls off the line with a full complement of custom touches from the Airflow Collection: full-length rider footboards with heel/toe shift levers, height-adjustable passenger footboards, engine guard, mid-frame air deflectors and splitstream vent. You want more. More is what you get. CHROME ONE-TOUCH FUEL DOOR: One button, one touch, fuel door open. Any questions? LED BRAKE AND REAR TURN SIGNALS: Notice the clean, no-nonsense lines of the rear fascia. Mounted inside, there are LED brake and rear turn signals. They not only give the CVO™ Street Glide® motorcycle a modern custom finish, they blast out light that's hard for the driver behind you to ignore. As Shipped - 833 lb. In Running Order - 867 lb.